Just as literary Penelopes confuse me, so too have I a tendency to mix up my Tims. Tim Pears, Tim Parks, Tim Binding, all conflate in my mind as a nonspecific white, middle-aged English novelist of no particular interest – so far. Tim Parks is the most prolific, having published 23 books in the last 23 years. On further searching (of memory and internet), I see that I have read one of his novels: Destiny (1999), which might have more accurately have been named Density, as I recall it as pretty challenging and cannot say now whether I even finished it. 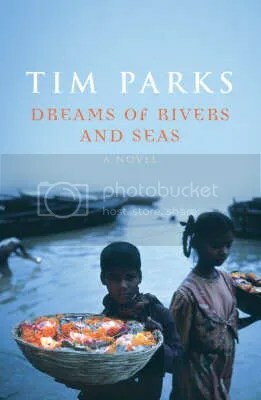 Now Dreams of Rivers and Seas is his fourth novel in five years, and it was only high praise in the newspapers, including from Indra Sinha, that made me feel I’d better give him another go. I’m glad I did, as this is a extraordinary and unusual novel. The cover indicates the Indian setting, but almost all the characters are Westerners, away from home, travelling, seeking. Looming over every page is the social anthropologist Albert James: but he doesn’t even appear in the book. On reception of his mother’s brief telephone call announcing his father’s death, John James took a deep breath, booked himself onto the first available flight for Delhi, had Elaine drive him to Heathrow, travelled towards the coming night and arrived at Indira Gandhi Airport to find the weather much cooler than expected. Dear John, for some time now I have been plagued, perhaps blessed, with dreams of rivers and seas, dreams of water. The letter that follows is gnomic, enigmatic – typical James, as we learn. As Helen is working in clinics to fight disease in a conventional way (a displacement activity, we suspect, and anyway, “a drop in the ocean … the Third World is a bottomless pit,” one friend observes), Albert is engaging in more curious pursuits with his students. ‘He asked us to draw the weather,’ one girl said. ‘And invent new insects,’ said another. ‘Mr James liked to apply very experimental methods,’ Sister Nirmala agreed. “Nobody understood the messages people communicated like Albert, and the thousand ways every message can be misunderstood.” This is the heart of the book, and of the family: John, as a child, “lived in the knowledge that other families were integrated in the world in a way that the Jameses were not.” The book is all communication, and about the things we learn, and the things we never learn, from conversations, letters, emails, text messages. John’s communication, and lack of it, is crucial to understanding the effect his father and mother have had on him. Dreams of Rivers and Seas moves into a dramatic gear toward the end, which breaks the spell after the cerebral and ‘talky’ feel of the rest, but probably injects necessary pace and direction toward a conclusion. Amid the ideas, the crossed relationships, the family mysteries and the intimations of all-too-human impropriety in the man whose “greatest ambition was to be a ghost … to be present and not present,” we are reminded by his widow why this knotty read is also so compelling. No one wants a book about someone who was entirely good.